Collage Background with Facebook Friends and Twitter Followers are possible using some simple tricks or Apps. Let us see how they can be done. Collage Background with Facebook Friends and Twitter Followers, in our honest opinion might attract more followers but how much they are effective for branding, thats tough to answer. However you can play with these tricks for getting Collage Background with Facebook Friends and Twitter Followers as all are free of cost. We honestly do not know who has discovered it. We got several blogs to claim they have discovered it. Well and good. The thing is – you will get a grid like friends list with thumbnail like small pictures. www.postermywall.com provide an app which helps to create Collage Background in easy steps. Just like FaceBook, Collage Background apps are also available for twitter too. 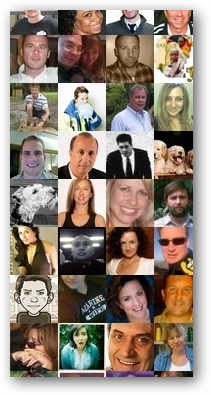 However, Collage Background with Twitter Followers are more interactive and attractive. One such app to create Collage Background with Twitter Followers is provided by twilk.com. This Article Has Been Shared 7034 Times! Twitter Header Design Tips to create a great design for a professional profile which will attractive and people will lick it like Mac to become your follower. Internet Marketing Plan For 2012-13 emphasizes on how the Google’s Various Free and Paid Services can be properly used to make your monetization smooth. Base64 Encoding Schemes are now frequently used in HTML5 design for the CSS part. But what this Base64 Encoding Schemes are and how you can use them? Guide to image in CSS to Base64 Data URI encoding shows you how to change from background image CSS to data to reduce page loading time. Cite this article as: Abhishek Ghosh, "Collage Background with Facebook Friends and Twitter Followers," in The Customize Windows, April 22, 2012, April 18, 2019, https://thecustomizewindows.com/2012/04/collage-background-with-facebook-friends-and-twitter-followers/.